Message Systems managed to make something of a splash last week with the news that we were acquiring Port25, our long-time rival in the on-premises email solutions sector. Judging by the reactions on Twitter and elsewhere, most customers and industry observers see this as a very positive move. However, some people have some legitimate questions that we want to answer. I will try to address a few of them here, and I know several of our colleagues will be posting on other questions later in the week. So let me initially address the question: why did we acquire Port25? This acquisition makes a lot of sense from a business standpoint on several levels. First, Message Systems has been and continues to be the leading on-premises email infrastructure vendor for very high volume senders. In fact, Message Systems customers are in an elite group of the largest senders in the world, and we as a company have done a good job of serving the distinct needs of that community. But not every company is an ultra high volume sender. There are many other companies that are medium- to large-volume senders who desire an easy-to-install and manage MTA product, and that is the market that Port25 has served very well with the PowerMTA product: mid-to-large ESPs, publishers, e-businesses and media companies. Some PowerMTA users do fall into the very high volume category – Experian Cheetahmail, for instance. But the company’s sweet spot has been the mid market, which is why we decided to purchase Port25, so that we could offer the best type of email solution for companies of all sizes who require an on-premises email solution. But there is a little more to the story. We also announced our SparkPost email cloud solution in November 2014. This offering leverages our leading-edge Momentum product and is designed to serve the email infrastructure needs for companies of all sizes who don’t want to build or operate their own systems, but would prefer an API-accessible cloud offering. That is something of a market unto itself. 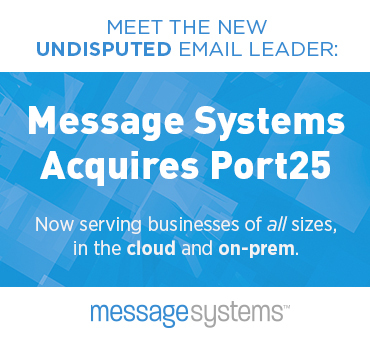 So acquiring Port25 really rounds out our capabilities and makes Message Systems the only vendor capable of serving the email infrastructure needs of companies of all sizes, whether they want an on-premises solution like PowerMTA or Momentum, or a cloud service like SparkPost. What does this mean to the email industry overall? Well, Message Systems now is an even stronger company, with greater resources and more email expertise and technology in our portfolio. And for our customers, that will mean more innovation and more technology choices in the future, both on-premises and in the cloud, if you chose to go that way. On a day-to-day basis, nothing will change for Message Systems customers or for Port25 customers. Port25’s technology, customer base and staff will be combined into Message Systems as a stand-alone business unit that will continue to focus on serving the small and mid-sized business (SMB) market. There will be no staff or organizational changes within Message Systems, either. If you’re a customer, this means that all your contacts within the organization – your sales account person, solution specialist, training and support contacts – they all remain at your service. In other words, it’s business as usual. As for questions about organizational philosophy and cultural fit, I’d point out that Port25 is every bit as dedicated to technological excellence and email best practices as Message Systems has always been. Consider that Port25 has been a strong presence within M3AAWG and other industry bodies, and that many world-renowned brands are PowerMTA customers, including Bloomberg, the New York Times, Esurance, Salesforce Marketing Cloud (ExactTarget), Experian CheetahMail, MailChimp, Campaign Monitor and more. They’ve also built a strong partner network that we look forward to leveraging even further as the business moves forward. We welcome the Port25 team, and their outstanding customer base, with open arms. To close: we’re dedicated to making this union a resounding win for Port25 and Message Systems customers everywhere, so you’ll be hearing more from us as we move forward in the weeks and months ahead. If you’re attending M3AAWG in San Francisco next week, I’d be happy to chat with anyone who has questions about the Port25 acquisition, and where Message Systems is headed in the future. In fact, we’ll have many veteran Message Systems and Port25 employees on the scene, so be sure to say hi, or better yet, join us for a beverage or two. Thanks Phillip, addressed the most concerns very well. But a true fact, Port25 acquisition is a nightmare for some of the startups and/or consultants. Thanks for your comment. One of the reasons for our acquisition of Port25 is the extensive network of resellers, consulting companies and independent consultants who have built a business in whole or in part around PowerMTA. We have no intention of changing these relationships, except in ways that can help grow our mutual business together. For instance we are very interested in further building out the network of reseller partners around the world, particularly in places like Asia/Pacific, Eastern Europe, Russia, and South America. We have zero intention of going into competition with our new partners. One concern people might have is that historically Message Systems has provided almost all the consulting services for the Momentum on-premise product. We do not intend to build a consulting team internally for the PowerMTA product. You — or any other Port25 partner or independent consultant — should feel free to get in touch with us if you have any further concerns, or if you would just like to discuss how we can generate more business and do an even better job of meeting the needs of our joint customers.